OK... i am quite excited about this chunk of steel and thought of starting a thread where we can gather as much information as possible whether it be technical stuff, photos (in particular), anything that one can discuss about the Deepsea Sea Dweller. Everything related to the DSSD can go here. I searched through the forums trying to find one similar thread yet i had no luck so that could set it. Hope we get it going guys. 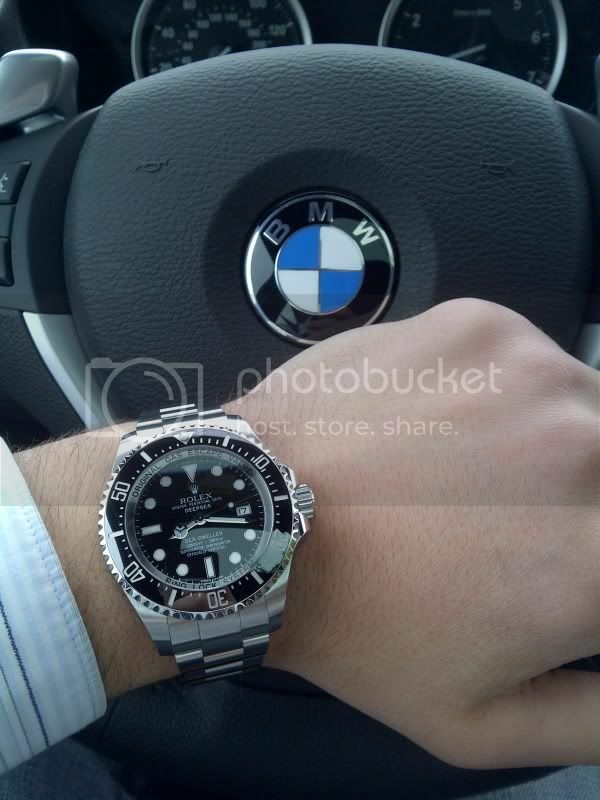 I'm in - Love my Deepsea! Hooper: Watch it! Damn it, Martin! This is compressed air! Martin: Well what the hell kind of a knot was that! Hooper: You pulled the wrong one! You screw around with these tanks and they're going to blow up! Oh yeah!! Count me in also! Would love to be an esteemed and proud member of this group. Absolutely love and cherish my DSSD also! There is this thread pertaining to the technical aspects of the DSSD.. It's from the reference library section! Well the idea behind this is more of an owners' thread as the name of the thread suggests. Still you are the man so it's your call if you want us to keep this one buddy! It's all good. I knew your reason for the thread was more of a members club! I just thought that info would be relavent to this thread as well! Here's a pic from my DS to add! Also Larry's thread has got some amazing technical info and pics. Thanks Rob and great pics guys. Love my DSSD. Interested in where this is going. Thanks. Would like to add that next. I'm in, I can't take my DS off these days! Absolutely love it! It also happens to be my most comfortable watch as well! Love my DSSD. Has become my everyday watch. Mine sez hello to its siblings. Love this watch...may never need another one??? Has taken over the rotation as my daily watch!!!! I feel priveleged to be part of this group!!! 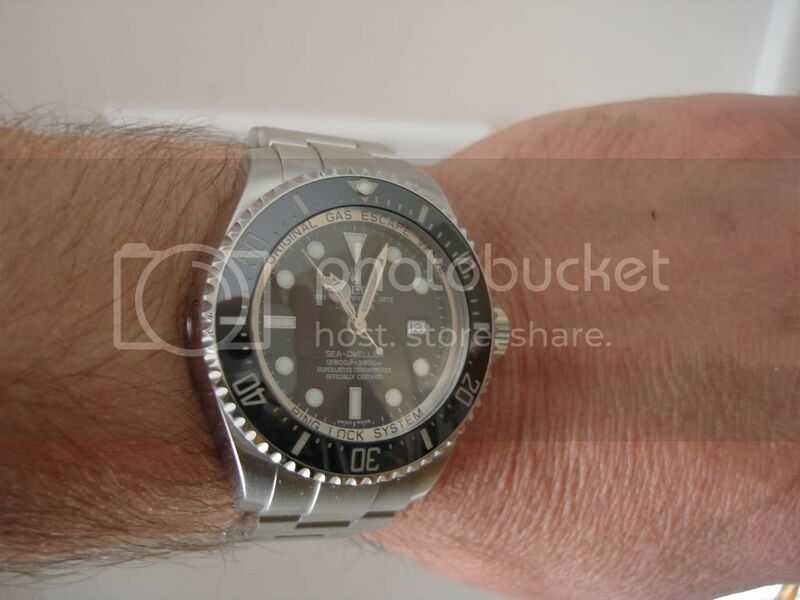 IMHO it's the best value sports watch that Rolex makes. When it was first released, it was not received well but I have a feeling it has gained in popularity since then. Indeed! I liked it since day one. However when i tried it on for the first time it fell awkward. After a couple of times i wore or tried this beast on i made my mind up. It looks gorgeous when properly adjusted to the wrist and the glidelock clasp is amazing. If not for the fact of the writings around the dial, I'd say a perfect watch. Due to that the dial could be bigger and better looking. 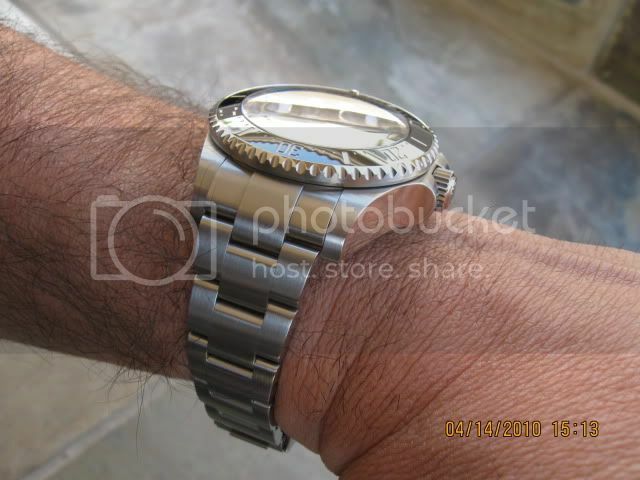 Also the watch deserves wider (24 or 26 mm) bracelet. 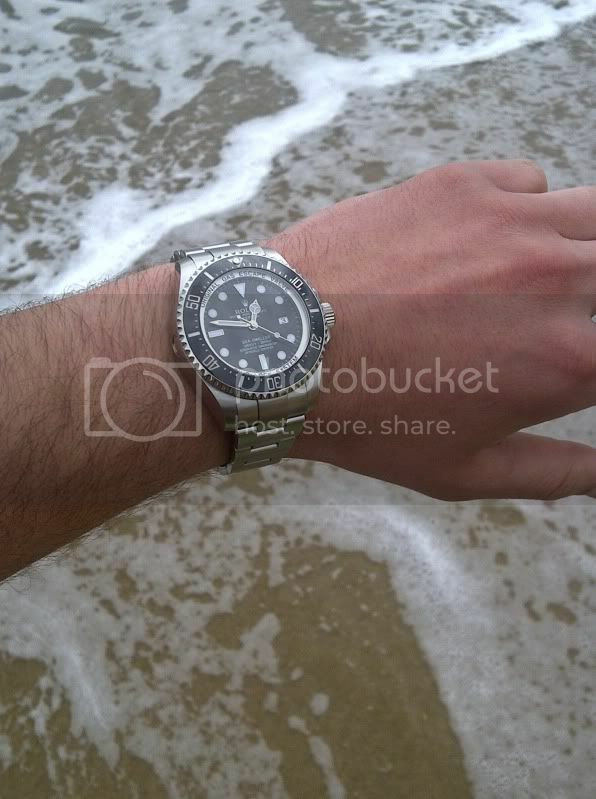 Anyway it is still ROLEX, still dependable, still durable. Yes i kinda agree they did not make a new dial rather they kept the original maxi dial and surrounded it with the writing. It doesn't look bad in real life (actually it looks great) and it is not as obvious as pics show; but if it was not for that writing, the maxi dial would have been bigger and i don't know how this would have affected the proportions of the watch. Yes, you are right. The watch could look like a clone of FF. Will surely get one back soon. Keep them coming guys!! Fantastic pics everyone!!! Like the font your using? Could it be, that since this a DSSD member's owner thread, we might not actually have to hear about how the DSSD is too tall or to large etc. That would be nice. I think we would all agree is the bold presence is what makes this watch so great. I find those "to tall" comments annoying. When you look at the comparable options of other brands, I feel it is the best. One main reason is that it has the Rolex name and heritage. I just spent a few days in Vegas at the watch shops there and in the end, the DSSD is my favorite. 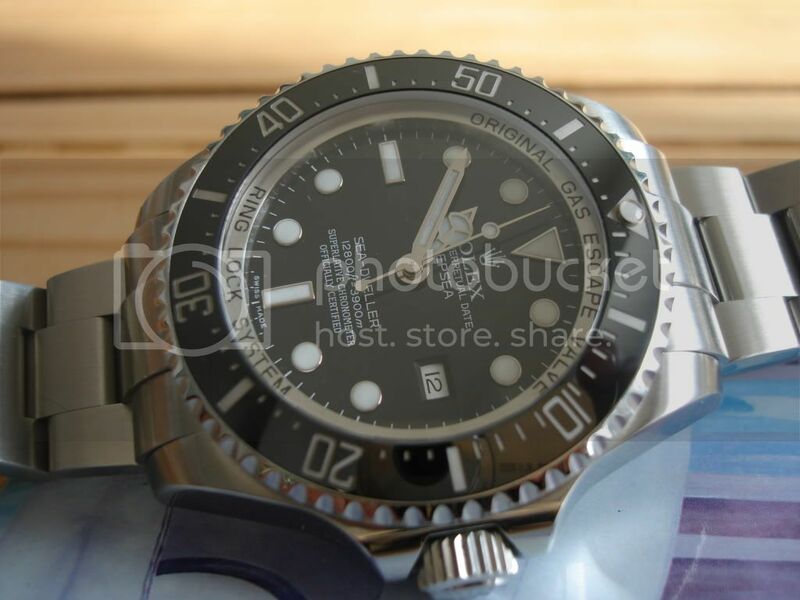 I am talking about comparable 30K choices such as Hublot, but also others such as Omega's Seamaster version. It appears that the people that choose to be on this thread understand that the DSSD is one of the most substantial watches available. Just saying! Could it be, that since this a DSSD member's owner thread, we might not actually have to hear about how the DSSD is too tall or to large etc. Well people are entitled their opinion but i think if someone sizes it properly it looks much better even on a small wrist. It appears that the people that choose to be on this thread understand that the DSSD is one of the most substantial watches available. Just saying!
" 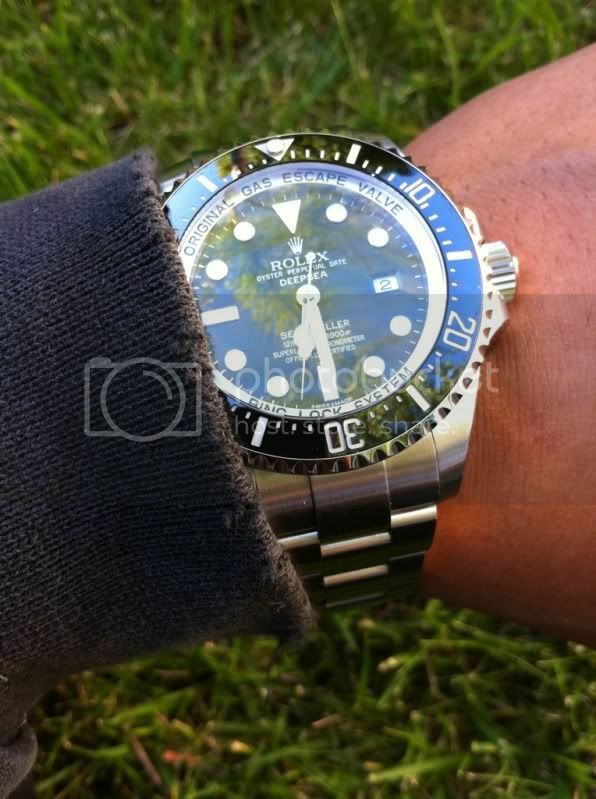 i think if someone sizes it properly it looks much better even on a small wrist." Just take out a link or two if needed. No big deal.